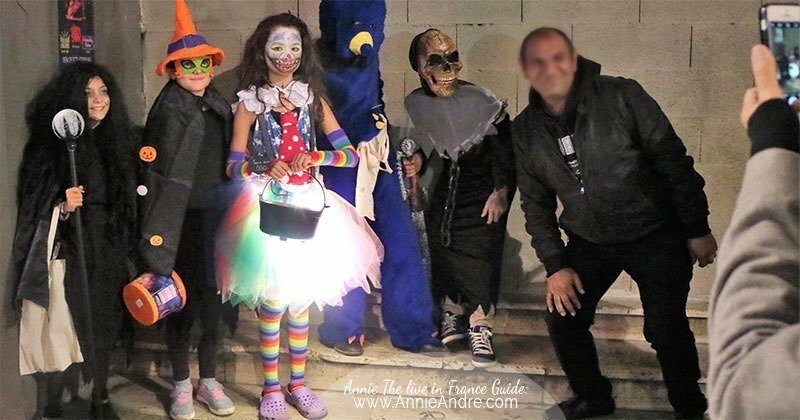 Here is exactly how we celebrated and organized our Halloween trick-or-treating in Montpellier France and why I now prefer doing it this way. 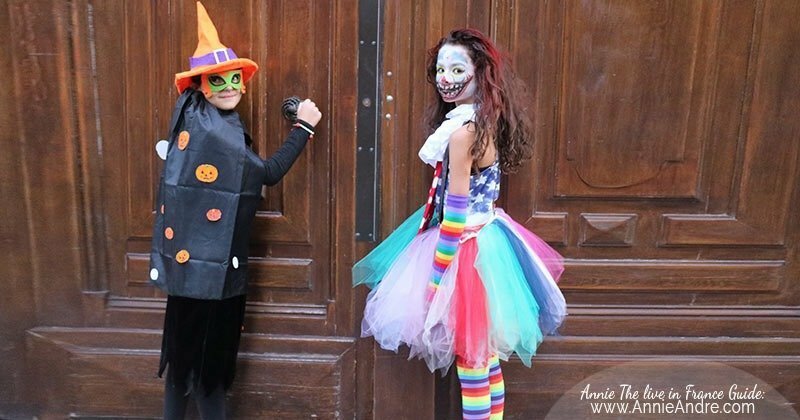 If you plan on taking your kids trick-or-treating door to door in France, be prepared for some pretty disappointed kids because Halloween isn’t embraced in France like it is in Anglophone counties. 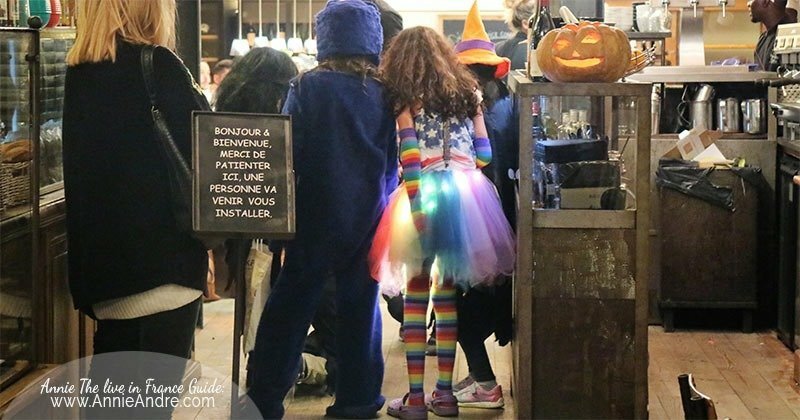 In general, French kids don’t go trick-or-treating door-to-door and people don’t typically hand out candy to trick-or-treater’s who knock on their door. There are exceptions but for the most part, this has been our experience in France. 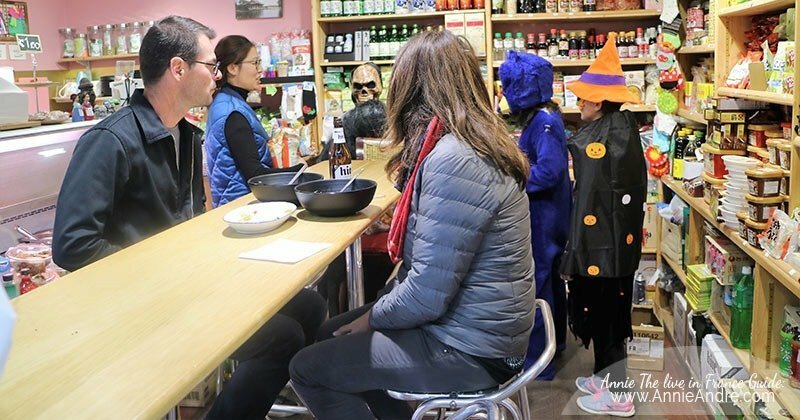 Instead, as strange as it may sound, you’re more likely to see kids going from shop to shop asking for treats because some businesses, shops and restaurants have gotten into the habit of passing out treats to dressed up trick-or-treaters on Halloween. Why the French hate halloween . 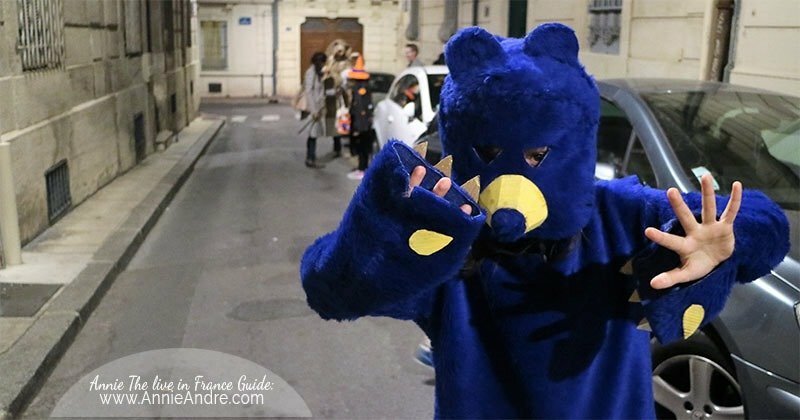 10 things you didn’t know about Halloween in France but should. If you live in the countryside of France where there is no concentration of shops and restaurants than your fun filled night of trick-or-treating is going to be pretty short however, if you live in a town or city where there is a large concentration of shops and restaurants, such as Paris, Lyon or Montpellier (to name a few), it could be a gold mine for the kids. We happen to currently live in Montpellier France. With a population of over 260,000 people, Montpellier is currently the 8th largest city and the fastest-growing city in France over the past 25 years. The city itself is sprawled out over 56 sq km (22 sq mi) but the heart of the city where all the action happens is the historic centre (called Écusson because it’s shape is roughly the same as a coat of arms) and “la place de la Comédie”- a large square adjacent to the historic centre. You could literally spend days strolling up, down and through narrow cobble stone streets of the historic centre of Montpellier which twist and turn under stone arches that date back to the middle ages. Depending on where your feet take you in the historic centre with it’s medieval streets, you’ll find an eclectic mix of trendy restaurants, quaint boutique hotels, shops, museums, open squares and a couple of massive Gothic churches. All of which gave a chilly Halloween feel to the night. I was actualy surprised how much fun it was going shop-to-shop trick-or-treating. 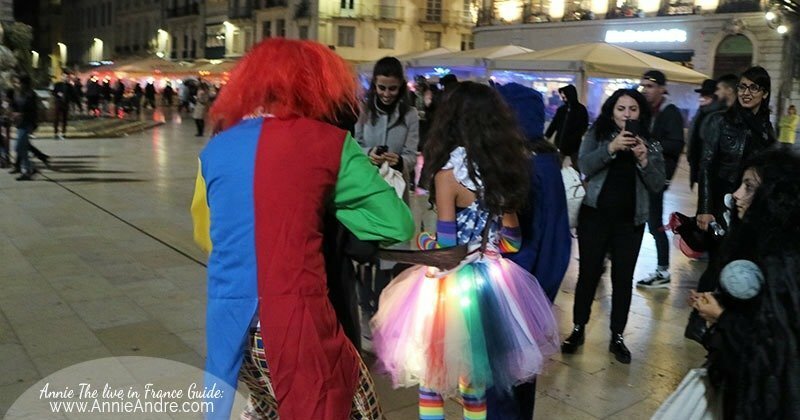 But the best part of trick-or-treating in Montpellier, besides the perfect weather was that there were plenty of places to stop off for a quick glass of wine or beer along the way for us parents who chaperoned the kids. 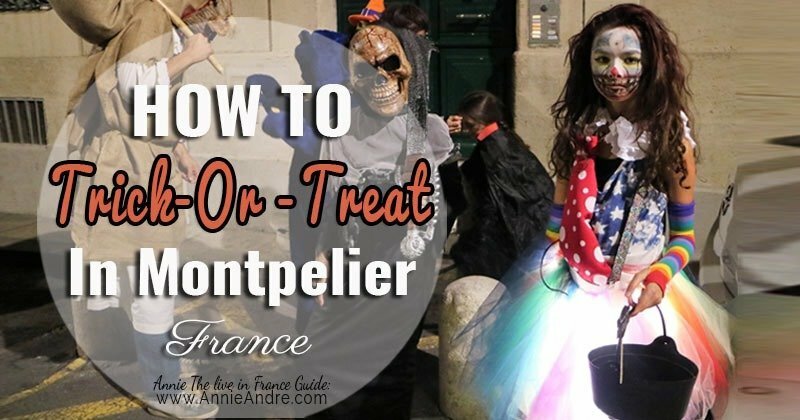 Now that you know why I prefer trick-or-treating in the medieval part of Montpellier over going door to door, let me tell you exactly how we celebrated Halloween. Everyone knows, trick-or-treating with a group is way more fun than solo. With that in mind, we made sure to invite kids and adults to our Halloween event. We actually had a lot more than trick-or treating planned. We did a Hybrid, Halloween party followed by trick-or-treating for adults and kids followed by a sleep over for some of the kids. We knew we would be out until late in the evening so we decided to have kids sleep over rather than have parents come and pick up their kids late at night. 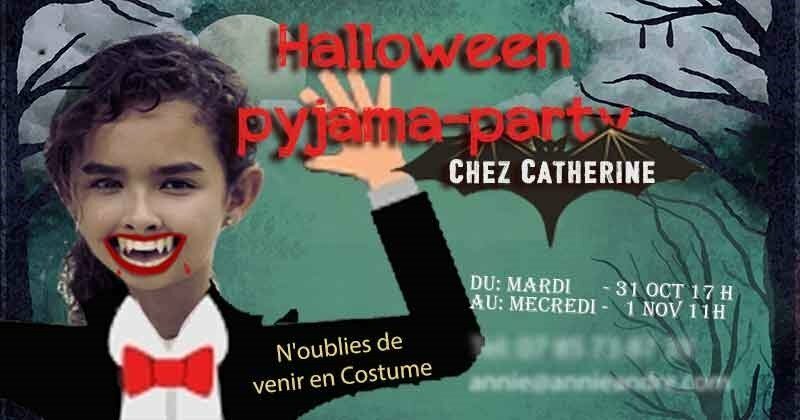 Several children couldn’t make the party because Halloween falls smack dab in the middle of a French holiday which lasts up to two weeks for some school aged children called Toussaint (all saints day). The kids that couldn’t make it were either away on vacation or had prior engagements. Most French people have never seen a house decked out for Halloween, at least none of the French people I have met over the past 7 years have. So I decided to really step up the Halloween decorations this year to give our French friends and their kids a taste of what Halloween is like. Since we live in an apartment, I couldn’t decorate our front yard with Halloween ghosts or a graveyard which was jus as well since no one would really appreciate it. Instead, I decorated our living room where the party was to be held. We cut out some silhouettes of black bats and black spiders and taped them to the wall. We also picked up some very scary Halloween decorations from our local party store called “Cash Fetes” in “Latte” the next town over- skulls, skeletons and spider webs. And of course, the lighting had to be just right. We placed candles everywhere and used ferry lights to decorate the table and the living room where the party would take place. For music, we piped in some retro Halloween music from YouTube which I streamed via Bluetooth to a speaker. I also streamed a spooky video loop on our TV using Google Chromecast. Here is the exact one I used. (click play on the video below). 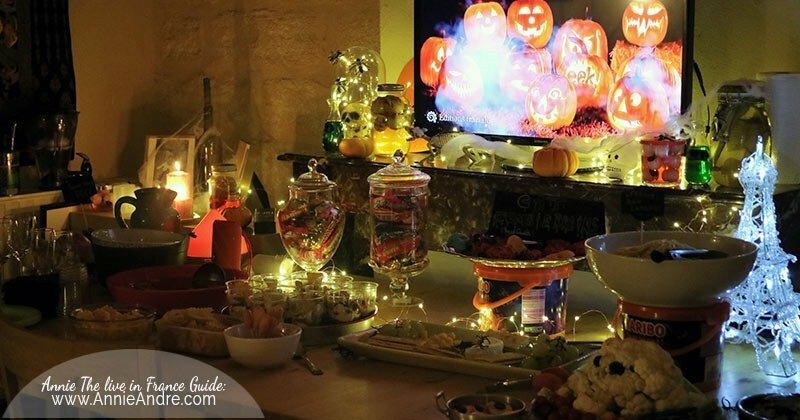 We wanted to serve food to our guests before taking the kids out “trick-or-treating “ so we took a page out of the French dinner party playbook and hosted an “apéro dinatoire” which If you’re not familiar with is a more elegant way of saying “finger food buffet and drinks”. Apero Dinatoire- not to be confused with a cocktail party where guests have a few hors d’oeuvres. At an apéro dinatoire, your guests eat the equivalent of a whole meal of finger foods. 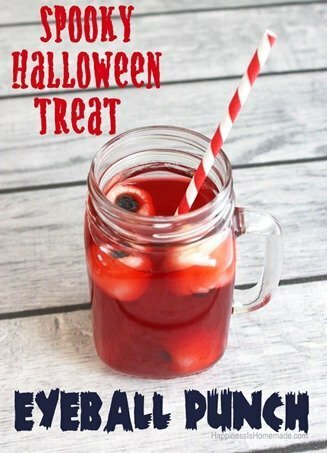 I’m no Martha Stewart, so to create our gruesome Halloween themed apéro dinatoire menu, I looked around the internet for some food recipe ideas. Here are a few of the ones we ended up creating. 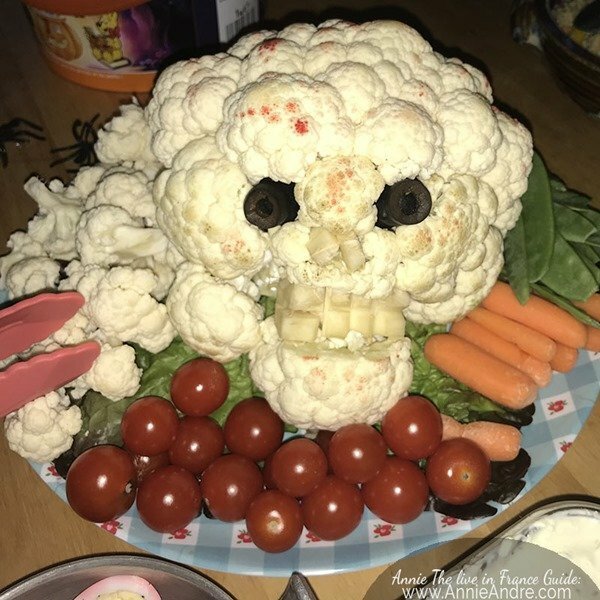 A veggie platter with a skull shaped head of cauliflower as the centrepiece. The veggie platter was a big hit and people instantly recognized that our cauliflower head was in the shape of a skull. You can get the directions to make the skull cauliflower head here. We added all sorts of vegetables (les crudités) to the platter and made a crème fraiche dip. We filled a large punch bowl with red punch and frozen eyeballs which were just frozenLychee stuffed with a blueberry. We made the eyeballs ahead of time and the effect was chilling and delicious. You can get the recipe here. We wanted some pizza bites but not just any old pizza bite. 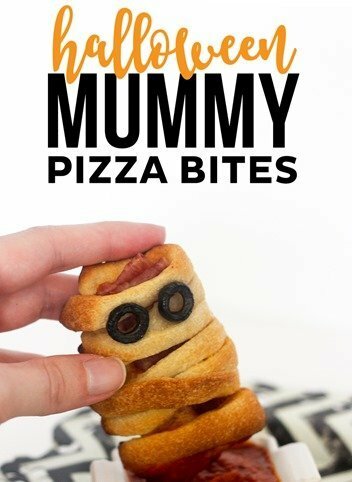 We found this really cute recipe to make mummy pizza bites. We used some pre-made pizza dough and pre-made red sauce to construct the little mummy which we also baked and froze ahead of time. 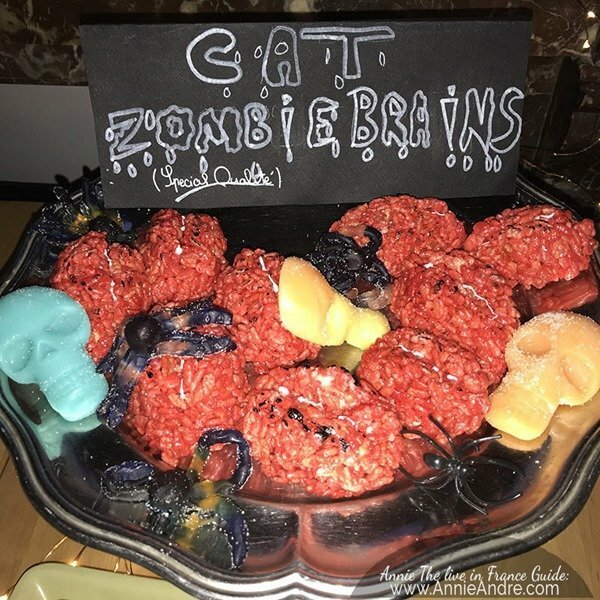 While looking for Halloween food ideas, we fell upon a super easy recipe to turn rice crispy treats into brains. They seemed easy enough to make but it did take a few tries to get it right. Tip: Rub your hands with butter to prevent the rice crispy treats from sticking to your hands as you form the brain shape and wait a few minutes to allow to cool before attempting to form the brains otherwise they don’t hold their shape. Of course, we make a cheese plate which wasn’t very Halloween like until we threw some plastic flies and spiders on the plate. A cheese plate is a must in my opinion. I let my daughter pick the cheese since she’s the cheese head of the family. We had some camembert, blue cheese, chèvre and an aged Gouda but you can use whatever cheese you like. We made a few other dishes too like spaghetti gut pasta, hot dogs which looked like fingers, spider egg quinoa salad (we threw in some black beans which we said were the spider eggs). You get the picture. For beverages, we had more wine than beer. That’s just the way it is in France. We didn’t stress out the day of the party because we started prepping food 3 days in advance. This gave us the freedom to devote the day to getting our costumes and makeup ready. Right before the guests arrived, we pulled everything we had prepared out of the fridge and turned on the oven to warm up a few dishes like the mummy pizza bites. Once everyone was settled in and had enough food and drink in them, we played a game which I had prepared ahead of time called “mystery box” but I’m sure it goes by several different names. You’re supposed have your guests stick their hands in the box and guess what you’ve put inside it. I made up a scary story to go with the game about some poor bloke who died and all that was left were his body parts. Then I asked the kids to stick their hands in the box and guess what they were touching. For example, we peeled grapes and told the kids they were eyeballs. For ears we sliced up some figs. For the heart we peeled a tomato. You just have to get creative. Here is a link to give you an idea of what you can use for body parts. After the food, drinks and games, we headed out trick or treating. It was about 7:30 pm- dark but not too late. 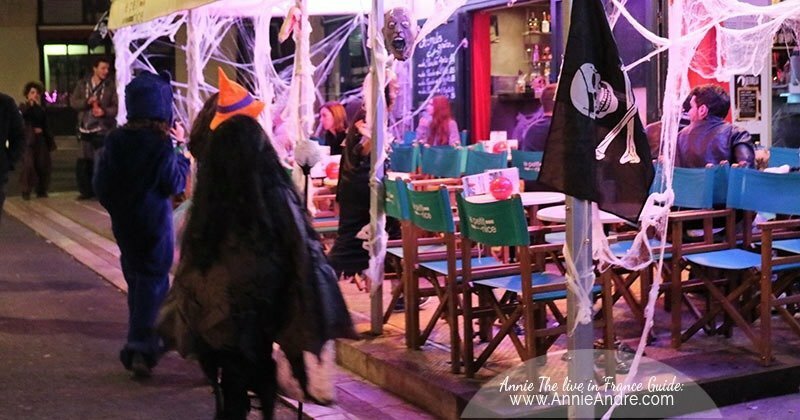 We thought we might be out for a couple of hours but we weren’t sure since we had never been trick or treating in Montpellier before. 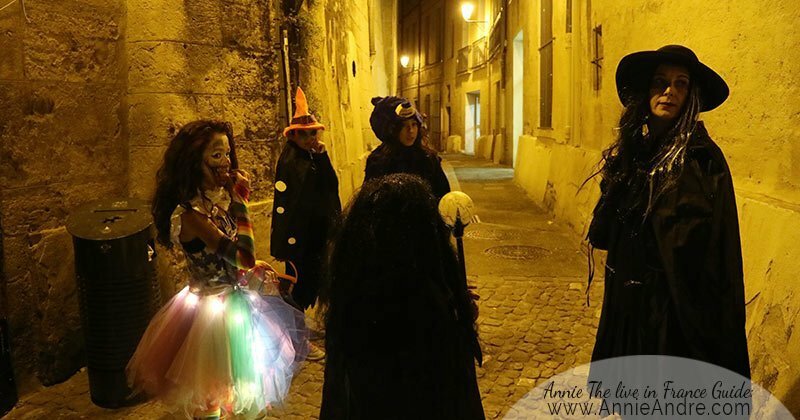 The good thing about trick-or-treating in the historic part of Montpellier is we didn’t need to have a route planned because every single street is bustling with activity in a very small area. Most of the shoe shops and retail stores were already closed but there was no shortage of bars, ice cream shops and restaurants to pop into. As we walked along the windy narrow streets of old town Montpellier, the kids ran in and out of each shop that was open and asked for candy. Surprisingly, none of the kids actually said “trick-or-treat”, they just said “avez-vous des bon-bons” which means “do you have any candy”. In the other areas of France where we have lived, the kids usually did say said “trick-or-treat” in French (des bonbons ou un sort). We saw about a dozen other kids trick-or-treating but we were the only group of kids. I think we actually saw more adults dressed up than children which didn’t surprise me. Everywhere we went, people stopped to stare at us and smiled. People were taking pictures of us too which was fun for the kids. 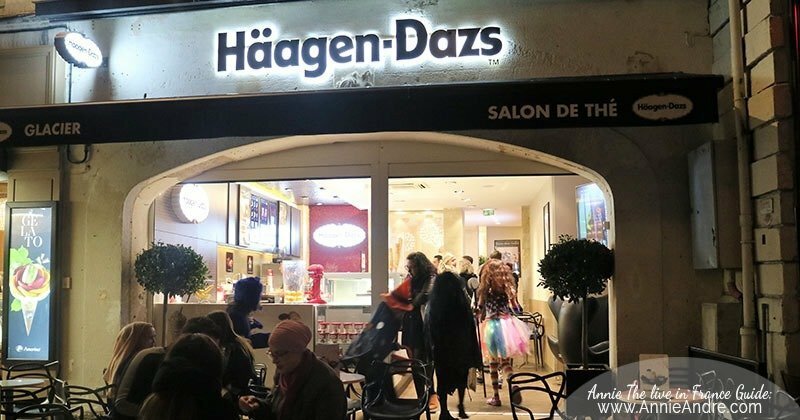 The good thing about trick or treating with adults and kids in old town Montpellier is that there were plenty of places we could stop into have a drink. The kids got some “sirop” or “limonade” while us parents opted for a glass of wine. Overall, the night was a blast and next year we’ll organize another trick or treating party with parents again.. If nothing else, it was a great way to get to know the other parents and their kids in a fun atmosphere.